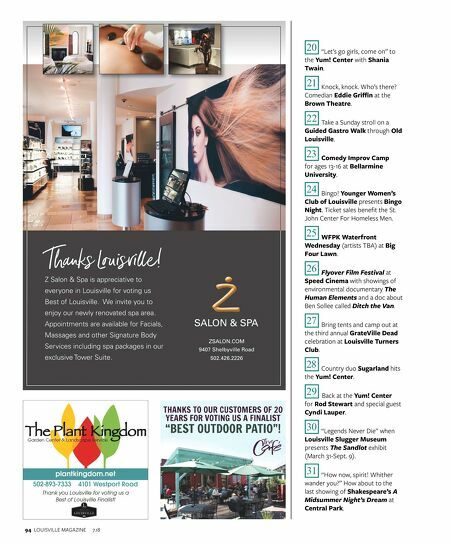 plantkingdom.net zsalon.com 94 LOUISVILLE MAGAZINE 7.18 K "Let's go girls, come on" to the Yum! Center with Shania Twain. L Knock, knock. Who's there? Comedian Eddie Griffin at the Brown Theatre. M Take a Sunday stroll on a Guided Gastro Walk through Old Louisville. N Comedy Improv Camp for ages 13-16 at Bellarmine University. O Bingo! Younger Women's Club of Louisville presents Bingo Night. 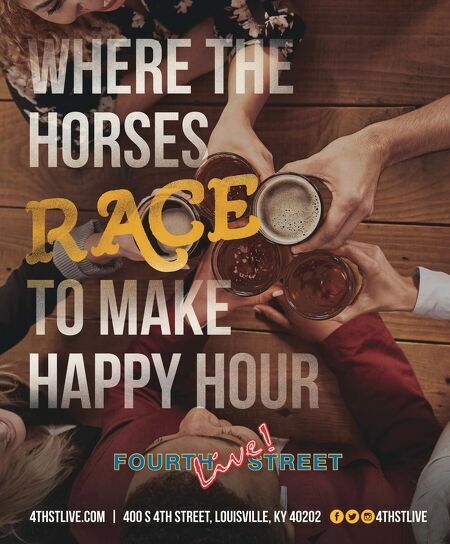 Ticket sales benefit the St. John Center For Homeless Men. P WFPK Waterfront Wednesday (artists TBA) at Big Four Lawn. Q Flyover Film Festival at Speed Cinema with showings of environmental documentary The Human Elements and a doc about Ben Sollee called Ditch the Van. R Bring tents and camp out at the third annual GrateVille Dead celebration at Louisville Turners Club. S Country duo Sugarland hits the Yum! Center. T Back at the Yum! Center for Rod Stewart and special guest Cyndi Lauper. U "Legends Never Die" when Louisville Slugger Museum presents The Sandlot exhibit (March 31-Sept. 9). V "How now, spirit! Whither wander you?" How about to the last showing of Shakespeare's A Midsummer Night's Dream at Central Park.